The security landscape of India is a complex one with two aggressive neighbours to the East and to the West. While problems with our western neighbor is widely reported, a sense of ignorance among the citizenry regarding our Eastern neighbor leaves several lacunae where our overzealous, sensationalist media is free to sow seeds of doubts. The Chinese, staying true to its policy of creeping advancement over smaller neighbours, had been pressurizing Bhutan to settle boundary disputes between the two nations. The dispute lies in 3 areas, but it’s the tri-junction that the Chinese deemed most vital. 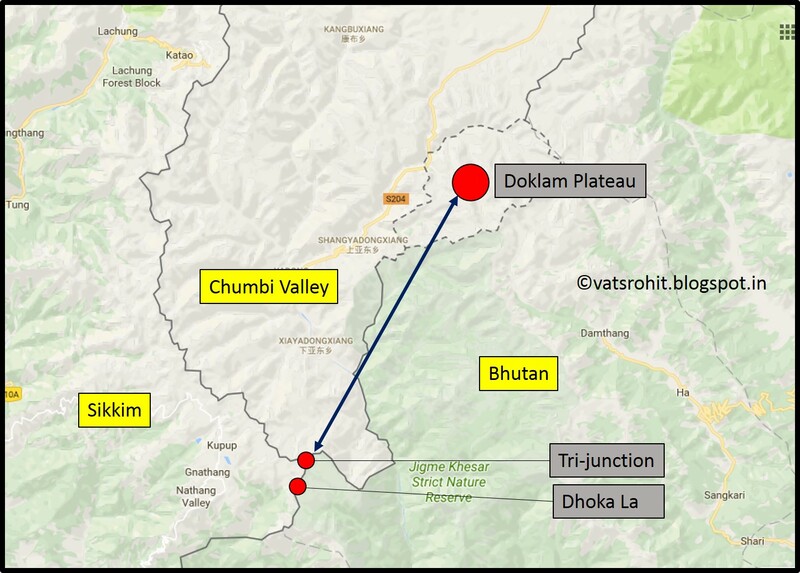 On 16 June 2017, Chinese troops with construction vehicles and road-building equipment began extending an existing road southward in Dolam, a territory which is claimed by both China as well as India’s ally Bhutan and directly borders India. 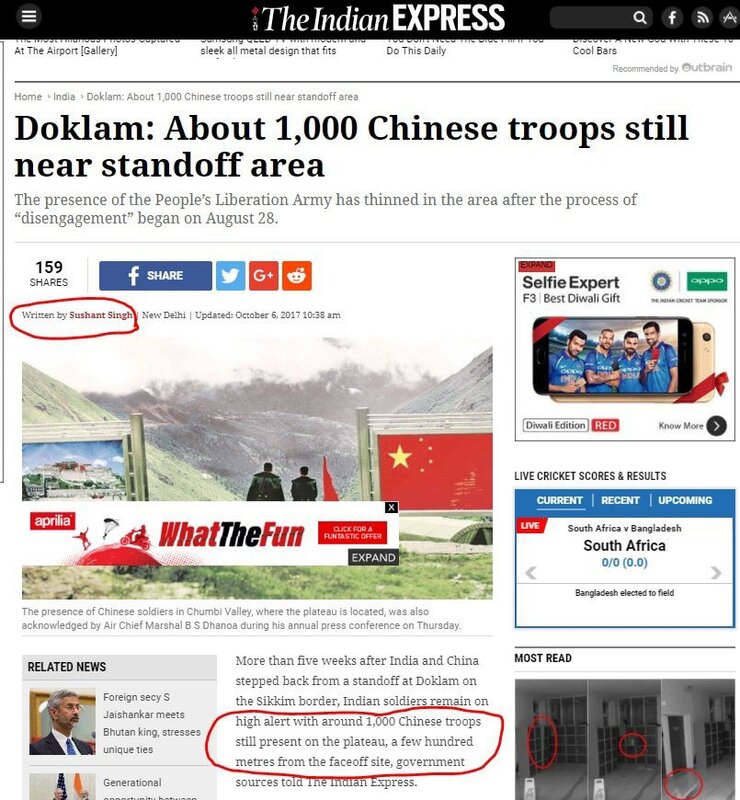 On 18 June 2017, around 270 Indian troops, with weapons and two bulldozers, entered Dolam to stop the Chinese troops from constructing the road. 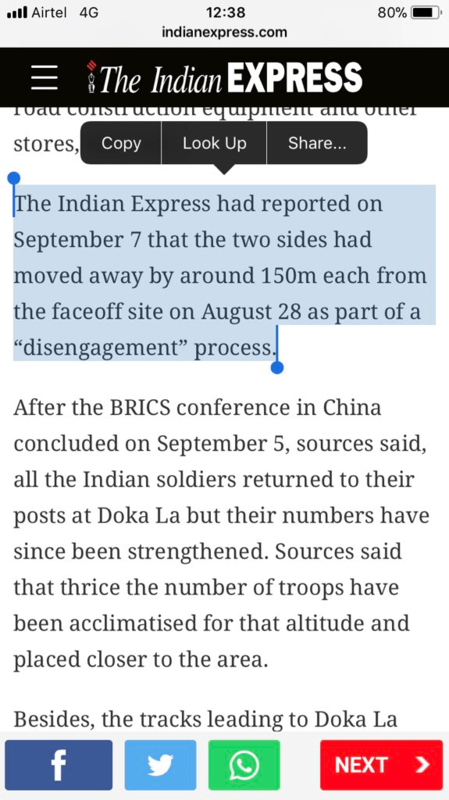 On 28 August, both India and China announced that they had withdrawn all their troops from the face-off site in Dolam. But as is the norm for Indian media and political opposition, it doesn’t take a lot of time for these elements to turn a security debate into a slug fest infested with lies and misrepresentations to score petty political points. 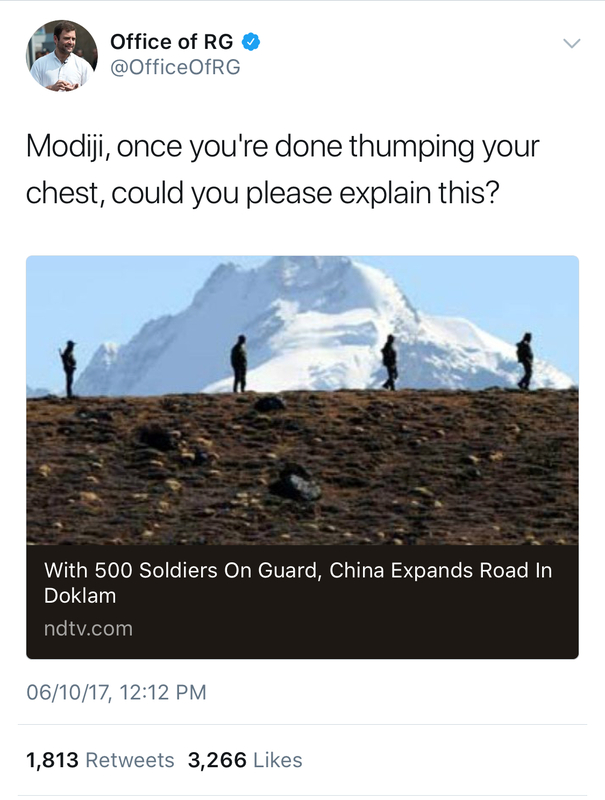 Today, we woke up to an article in NDTV, written by journalist Vishnu Som that read – “With 500 Soldiers On Guard, China Expands Road In Doklam”. 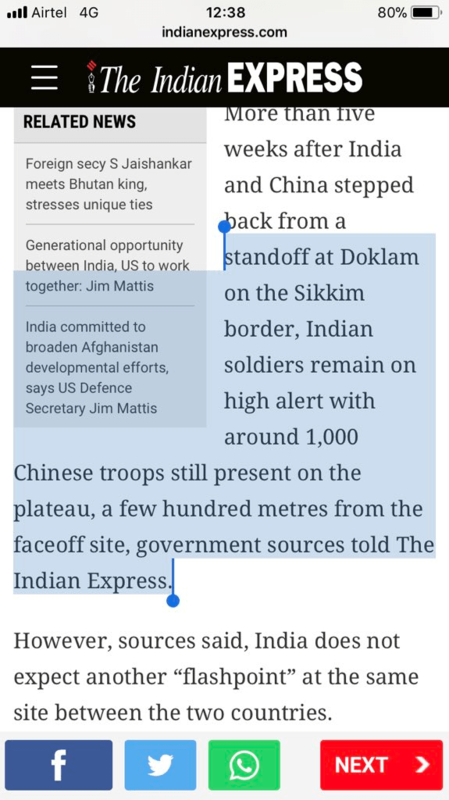 “Barely a month after the winding down of an aggressive stand-off with India at the Sikkim border, the Chinese army is back to building a road on the Doklam Plateau, just 10 km from the location of the last conflict. The Doklam Plateau is claimed by both Beijing and Bhutan as their territory. India backs Bhutan’s claim. Mr. Som is incorrect on several accounts here. Firstly, the government said that India and China had accepted to ‘disengage’, not withdraw. Also, the status quo ante was agreed at 150 meters. Hence, details being ‘sketchy’ is really out of the question. 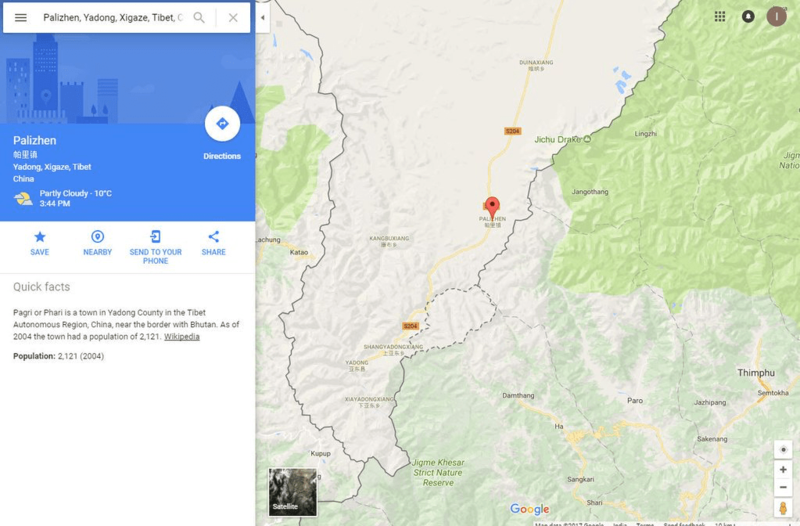 Now, barely 10 kilometres from the location of the stand-off, China is expanding an existing track, reinforcing its claim to the disputed and remote Doklam Plateau. India backs Bhutan’s claim to the region and has made it clear that it will not tolerate any infrastructure that would allow China access to the Chicken’s Neck, located just south of Doklam. Now, Mr. Zorawar Daulet Singh, Fellow at Center for Policy Research says that only if the build up is in the south of the Sinchela ridgeline, would this ‘new’ Chinese construction activity be in ‘disputed territory’. 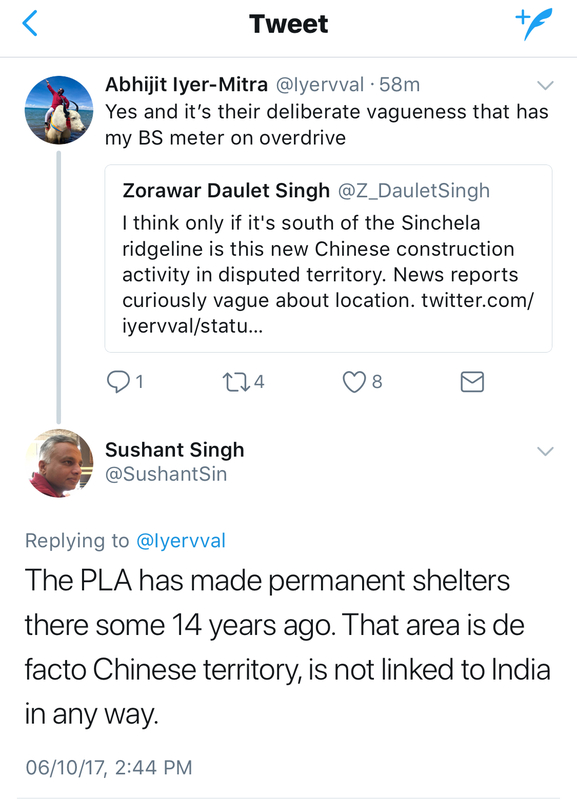 To that, Associate Editor of The Indian Express, Mr. Sushant Singh asserted that the PLA had made permanent shelters there some 14 years ago and that area is de facto Chinese territory, not linked to India in any way. It is thus to be noted here, that none of the news reports that assert fresh build up are willing to give the location of such build up and have mostly resorted to cheap and vague infographics. 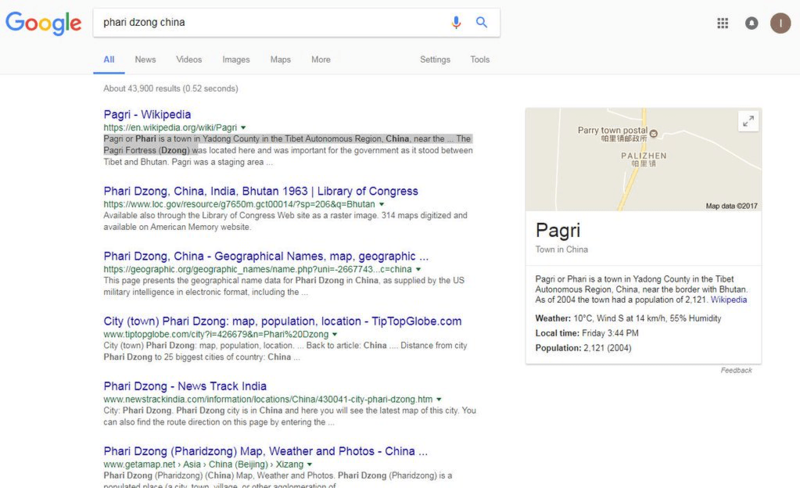 When the area is located on Google maps, this build up can be easily marked if information is true and available, considering Google maps in India provide locations as per Indian status quo. None of the journalists discussing this issue are willing to mark the exact location despite repeated requests. 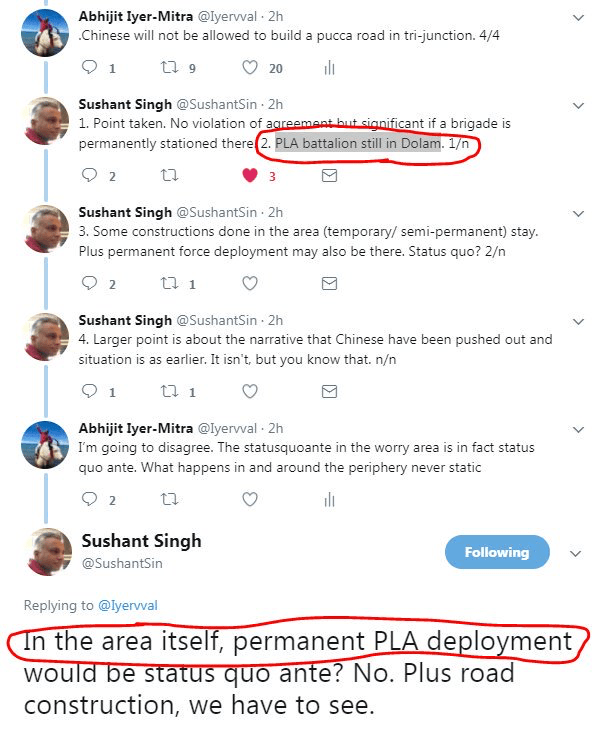 Even without that information, it would seem that the alleged construction is happening on Chinese territory and it doesn’t affect status quo ante post Doklam standoff. 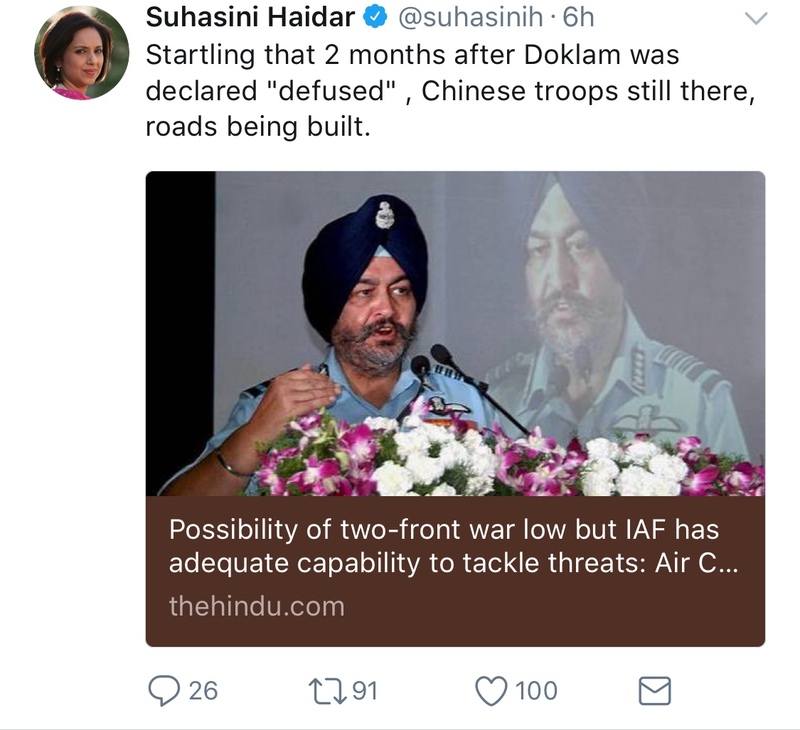 Interestingly, Mr. Singh tried to hedge his argument here by subtly hinting that the presence of Chinese troops were somehow breaching status quo. This assertion is correct. The status quo ante was agreed at 150 meters from the sight of the flashpoint. Now, since the status quo ante was agreed at 150 meters, Chinese troops being present “A few hundred meters” from the site of the standoff shouldn’t be a point of debate at all. Specially in the context of the standoff that was resolved a few months ago. Sushant Singh’s use of the word “still” points towards him implying that the troops that were meant to be pushed back post the standoff ending, in fact, haven’t been pushed back and continue to camp out on the same area thereby violating status quo and negating the claims of the Indian Army and the Indian Government. 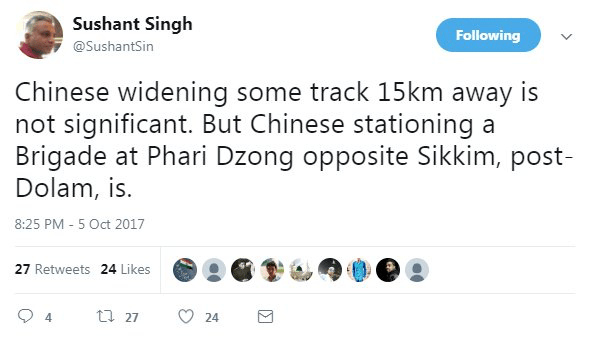 Mr Singh, in his conversation with Ms. Suhasini Haider, who was also way off the mark in her understanding of the situation acknowledged that Dolam and the tri-junction area is the face-off sight and that the current track improvement by the Chinese is some 15 Km North East of the face-off sight. 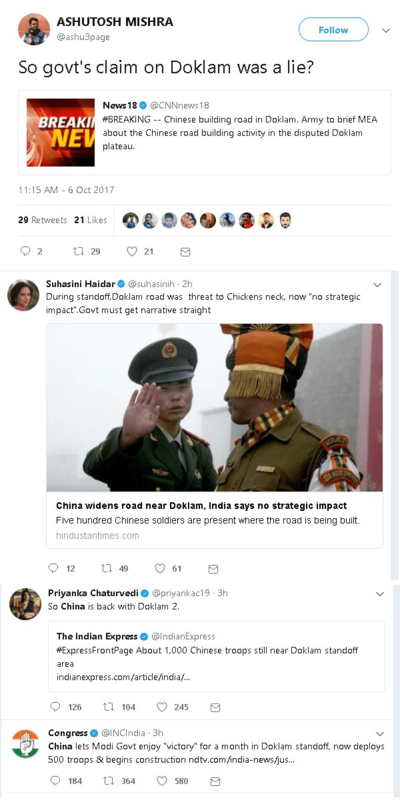 But surprisingly, in his very next response, goes back to plugging in Indian Express article that subtly insinuates that Chinese troop presence beyond the 150 meters agreement, maybe a violation of status quo. 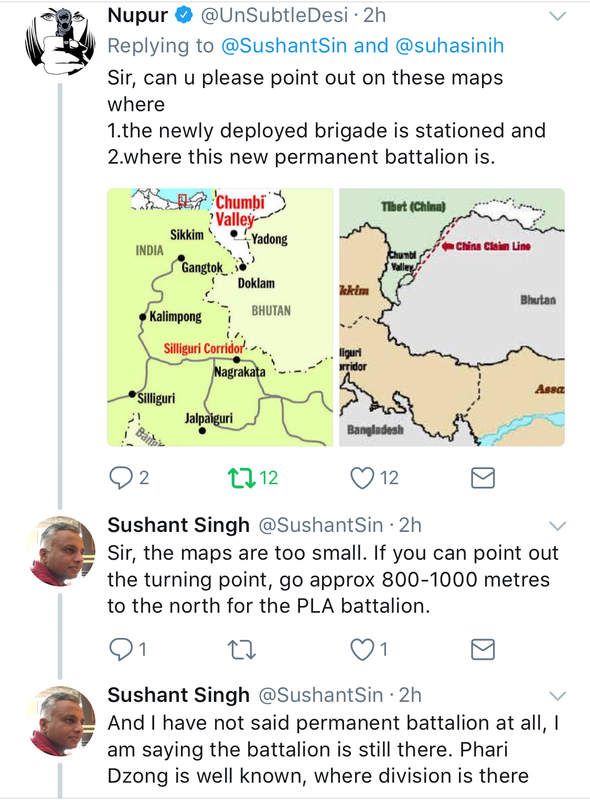 Since the discussions revolved around questionable conclusions, I asked Mr. Sushant Singh to point out on the map where this alleged troop buildup was taking place. When Mr Singh says that the troops would be approximately 800-1000 meters to the north of the turning point, It reaffirms the fact that the 150 meter status quo ante hasn’t been violated. 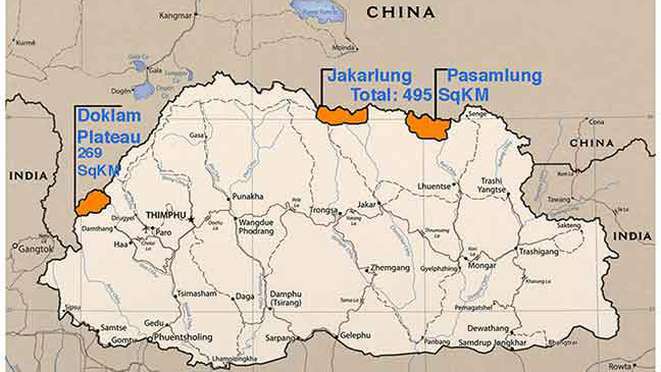 He also says that that Chinese Division is present in Phari Dzong. He had earlier asserted that Phari Dzong is an area ‘opposite Sikkim’ and post Dolam, that stationing is significant. When researched further, one realized that Phari Dzong is actually deep into Chinese UNDISPUTED territory and that it doesn’t face Sikkim but is closer to Bhutan with several mountain ridges blocking it from Sikkim – a few days if not weeks trek. 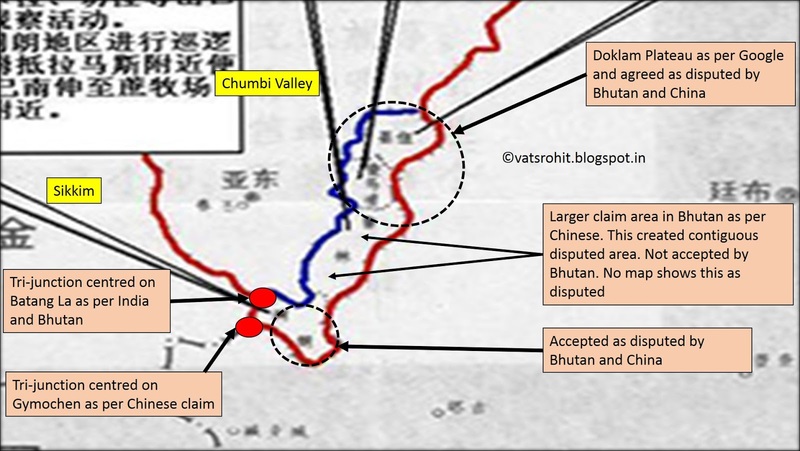 Mr Sushant Singh had earlier pointed out that this confusion is because of the loose usage of the terms “Doklam” and “Dolam” and that Dolam was the actual face-off sight in the Doklam Plateau. 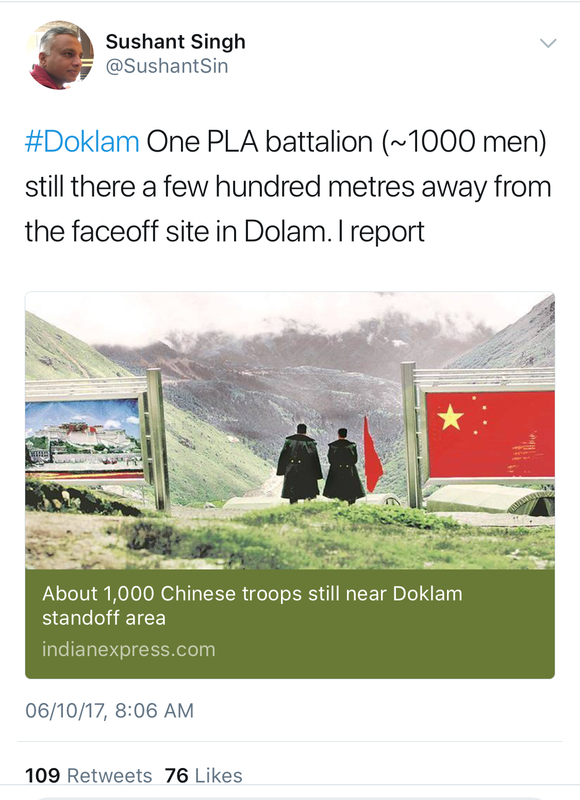 When asked, that if his earlier explanation of confusion between the terms ‘Dolam’ and ‘Doklam’ hold true, wouldn’t it then be wrong of him to assert that the Chinese troops are deployed in ‘Dolam’, which was the disputed location, while the government had confirmed that the troops were in ‘Doklam’, the larger plateau? I then repeatedly (twice) asked Mr. Sushant Singh a simple question. Was it his belief that the Chinese troops were present in the DISPUTED TERRITORY. 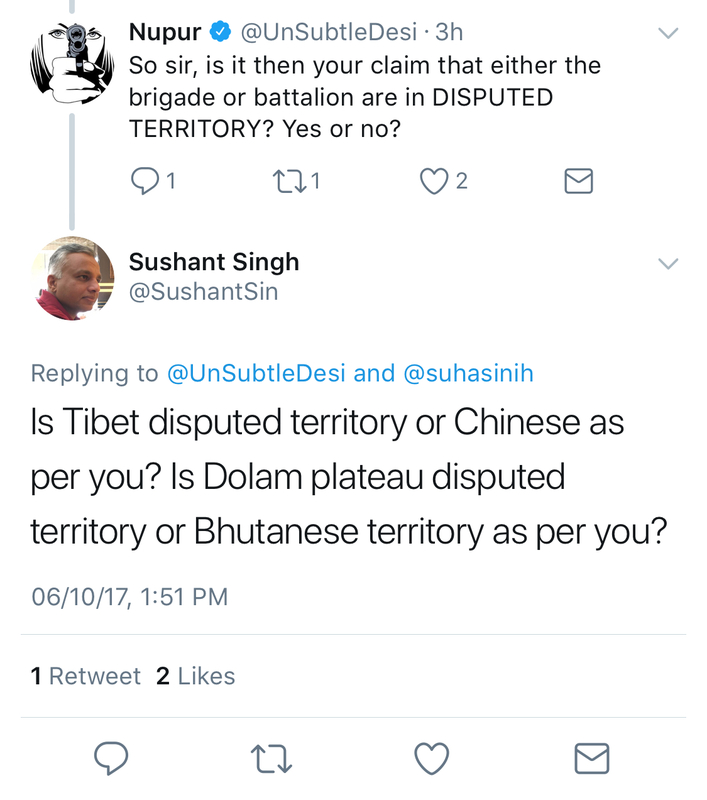 Both times, Mr. Singh craftily shifted goalposts without giving a straight answer, which could either be yes or no – instead asking me if I considered Tibet or Dolam to be disputed. Mr Singh of course knows quite well that India accepts Tibet as a part of China, and what matters here of course is the Indian, Bhutanese and Chinese states interpretations – specifically as popular blogger Rohit Vats has pointed out the area between the blue and red lines is what is disputed . Despite repeated requests to him to mark the areas and trooping levels out on a high resolution Google Earth map, he simply refused. Which means that he himself seem confused on firstly where the actual face-off was and what is in dispute, and the fact that he was himself muddling the situation because he categorically refused to state that any of the troops mentioned either in his or Vishnu Som’s article were in the actual standoff area in Dolam, that come under the purvey of the India-China disengagement agreement. 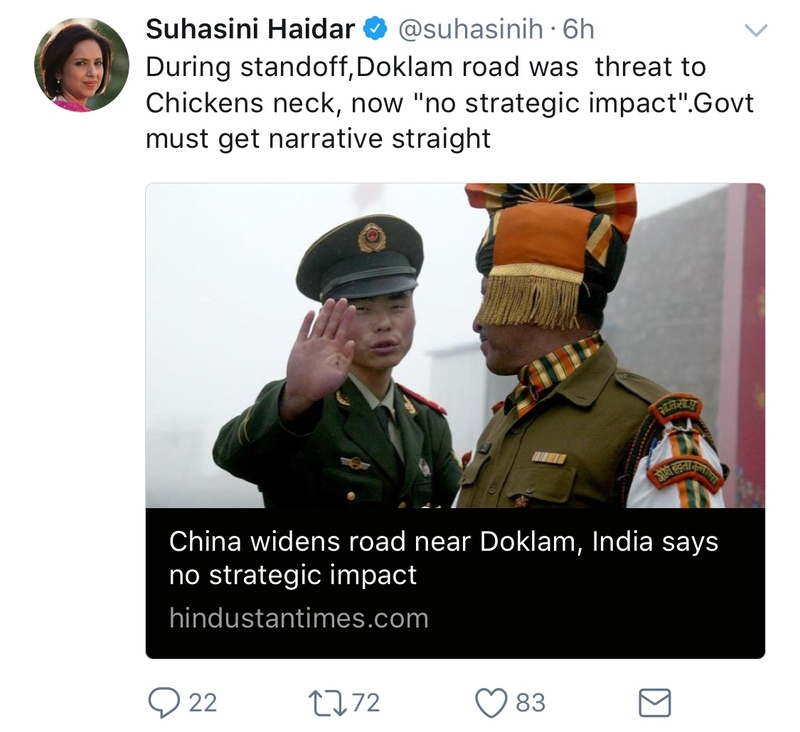 When I spoke to Colonel Danvir Singh Chouhan, Gallantry award winner Veteran of the Indian Army and Associate Editor of Asia’s largest defence magazine, he thought that the Dolam standoff was a thumping victory for India not just militarily but also in thwarting China’s nefarious designs of aggression and supremacy. India kept her nerves and refused to blink regardless of repeated provocation and that was also a massive psychological victory over a neighbor that sought to place itself as an aggressive eastern superpower and there is no question that the status quo ante is being maintained. Chinese troops have been present on the Doklam Plateau since a long time, but as long as the 150 meters agreement is adhered to, and no ‘pakka construction’ happens on the area we pushed them back from, the issue stands resolved for now. He was of the opinion that this sudden chatter is owing to vested interests trying to give issues of national security a political color and score a brownie point over the government of the day. This begs the question – is the job of a journalist to give clarity or muddy the waters? Today, we saw journalists from NDTV, The Hindu and The Indian Express join hands with uninformed politicians to build a narrative – based on nothing but their own uncertainty and lack of either facts or knowledge, with significant geopolitical consequences for the country. Surprisingly there was no such claim of China being back in business in the disputed region in Chinese mouthpiece Global Times or such state controlled media outlets. Perhaps they don’t need to do that, as some elements in the Indian media are doing their job.